ABOUT BROOM - WHAT'S THE PROBLEM? Scotch broom was brought to Vancouver Island in 1850 by Captain Walter Grant. He planted a few seeds in Sooke, at the southern tip of the Vancouver Island. Since then, Scotch broom has spread north rapidly and densely across Vancouver Island and adjacent islands, and all across the Pacific Northwest It quickly takes over disturbed areas along roadsides, railways, forest roads; and quickly covers fields, meadows and any deforested areas. It covers large expanses under power line corridors. Broom thrives in sunlight. A single broom plant can produce up to 18,000 seeds which remain viable in the soil for 30-40 years. When exposed to sunlight, broom seeds sprout! Attempts to control the spread of broom have been minimal. Power companies and railroads didn’t mind it or even encouraged the spread of broom because broom stops trees from growing. The rest of us hate broom for the same reason – broom prevents trees from growing! We want forests of fir, hemlock and cedar – not flammable forests of Scotch broom! Greater details about the Problem with Broom. Scotch Broom is a highly invasive woody weed. It grows rapidly, crowding out native plants and preventing regrowth, retarding or preventing the growth of many understory species, preventing the regrowth of forests, leading to a dramatic loss of diversity. It forms dense thickets, shelters feral animals, reduces food for native wildlife, blocks paths and creek lines. Scotch broom also changes soil chemistry, making it unsuitable for local native plants. From three seedsbrought to the Island in 1850, it has colonized the southern Island and is moving north at an alarming rate. Impact on Wildlife: Wildlife and farm animals will nibble on the broom flower occasionally, but it is not food for them. Broom contains toxins, and takes over meadows of grasses and wildflowers that wildlife do need to eat. Fire Concerns: Scotch broom is highly flammable, making it a hazard everywhere, especially along highways, in power line corridors, and in dry forest areas. It has a high oil content, and parts of the bush die off naturally on mature plants, so there is always dead wood, even on “healthy”plants. Having broom lining our highways is a serious fire hazard. 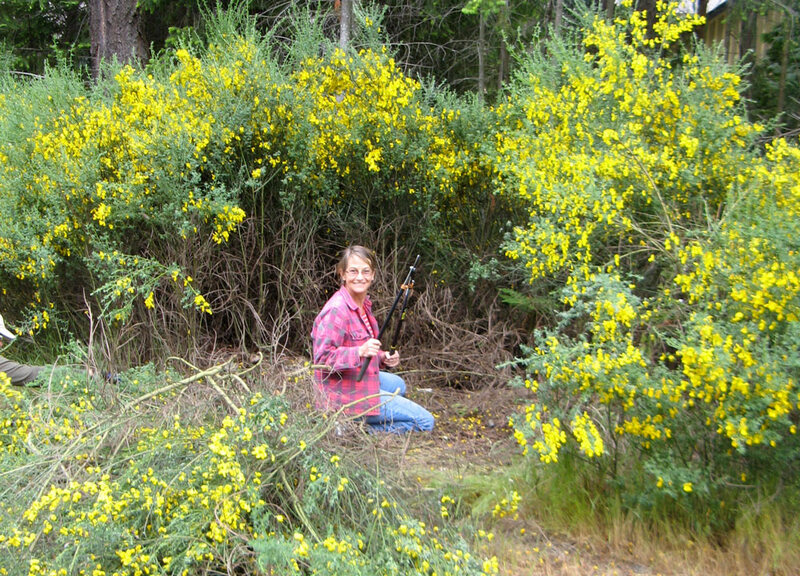 “Scotch Broom is a volatile flash fuel – particularly with the mature plants. The presence of Scotch broom will increase a wildfire’s fuel load and escalate the fire’s intensity, compromising fire situations and making them more difficult to fight.” Terry Peters, Fire Chief of Powell River B.C. Scotch Broom Threatens Farmland: Once the woody weed takes root, a tractor can no longer till it, and if mowed, it develops multiple stalks that become denser and harder to remove. Pasture land is very difficult to reclaim. It creates a tripping danger for horses and other livestock. It has to be cut or pulled out, one plant at a time. Few small farmers have the time, resources or strength to deal with it, so it continues to spread. With all the justified concern about food security on the Island and elsewhere, we need to keep our pastures and fields open and tillable. Farms in New Zealand, Australia, and world wide have been abandoned after being taken overby Scotch Broom. in bloom. As the plant spreads and becomes more dense, their health condition worsens. Allergy sufferers have expressed much gratitude to Broombusters who have removed broom from their neighborhood. Tourist industry: The bright yellow flowers of broom are pretty at a distance for a couple months of the year. But then it becomes a scraggly, half dead presence, blocking and overwhelming the beautiful fields, flowers and forests of our Island. Broom has become a serious tripping hazard on hiking and mountain bike trails. Myth 1: YOU CAN’T STOP BROOM. FALSE! You can stop broom, but you have to do it right. If you CUT BROOM IN BLOOM, at ground level, the broom will die in the summer’s dry heat. If you disturb the soil by pulling or digging, the persistent seeds from previous years will sprout. Broom needs sun. Don’t disturb the soil. Take care to keep the ground cover in place (grass, trees, salal, native plants – even weeds!) In the shade of the groundcover, the broom seeds remain dormant. In the sun, seeds will sprout. Small broom can be pulled. Larger broom should be cut at ground level or just below. It works! Myth 2: BROOM IS NATURALIZED. FALSE! Naturalized is a soft sounding word for a plant that has found its niche and is in balance in the ecosystem. But broom is bully! It is just getting started. It will continue to take over – like it has in Australia, New Zealand, Spain, Portugal, Brazil, and on & on….“Naturalized species may become invasive species if they become sufficiently abundant to have an adverse effect on native plants and animals.” That has already happened.